Leading Manufacturer of biscuit tray from Vasai. 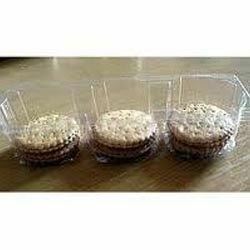 We offer a superior quality array of Biscuit Trays. Our range of Biscuit Tray is appreciated for its excellent quality and durability. The range of biscuit tray is manufactured using advanced machines, and comes with accurate designs and various materials such as PVC, HIPS, PET etc. Further, we offer Biscuit Trays in varied designs, sizes and shapes, at reasonable prices. The range of biscuit tray finds wide applications for packaging variety of biscuits and keeps the biscuits fresh and safe for a long time. Note:- "Prices differ as per the specification and requirement".